The Villa Cusona estate in San Gimignano, owned by the Guicciardini Strozzi family, has been in existance since 994 and wine was first produced there in the 1200s. 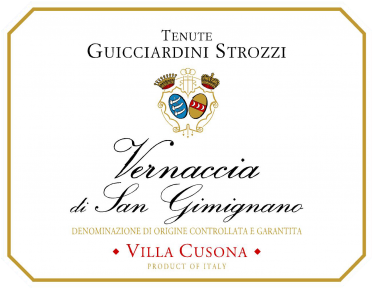 The Vernaccia di San Gimignano ‘Villa Cusona’ is made with 100% estate-owned grapes. It is a very distinctive white wine, recognizable for its straw yellow color, intense varietal notes, heady floral bouquet and a lovely bitter almond aftertaste. It also reflects its nutirent-rich terroir offering a marked mineratlity. Harmonious and fresh while structured at the same time. The dry character and the acidity make it a perfect choice for fish-based dishes but also pasta with cream-based sauces and cheese boards. Vinification takes place in stainless steel tanks, with temperature-controlled fermentation to enhance frangrance and freshness.